Summary: Mara Dyer believes life can’t get any stranger than waking up in a hospital with no memory of how she got there. Review: I’ve been wanting to read this book forever but being the cheap/frugal person I am I can’t see myself paying full price for a novel. I found this on BookOutlet last weekend and I was ecstatic. I read it under 24 hours! I had no idea what this book was about but so many people had read it and gave it such high ratings. After reading I now know why. It isn’t dystopia, it’s set in our normal world. Miami. The way the story unravels I had to find out what was happening. There was a slight foreshadowing that kept you reading to find out what was going on. And as soon as you figured it out another moment happened. It fit together lovely. What I didn’t like was the characters other than Mara and Noah. I didn’t really make a connection with them they were just kind of there. Also every time I read a YA novel the snarkiness that’s said back and forth between two love interests seems so fake. It always seems off to me. Like it doesn’t really happen in real life. I also noticed some errors. Like you know when you’re writing an assignment and you accidently right the same three words again? I noticed that with a few sentences. It’s like she decided to change the style of the sentence and just kept the other in there. Maybe that’s not the case and I missed a few words. I did fly through the book. And why that ending? Why? I hope to purchase the second book in the series soon! 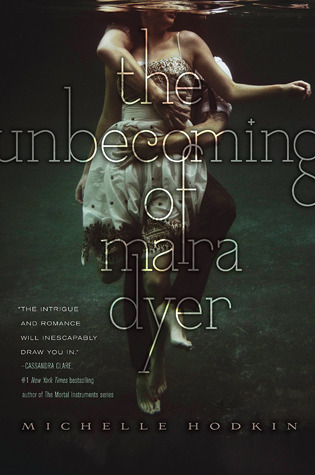 This entry was posted in book review, books, review, the unbecoming of mara dyer. Bookmark the permalink.